Getting vitamin A in your diet has never been easier than looking at a vitamin A foods list to guide you along the path of balanced nutrition for lifelong health. Vitamin A rich foods such as liver, carrots, and spinach are especially important in your diet when it comes to preventing loss of vision. 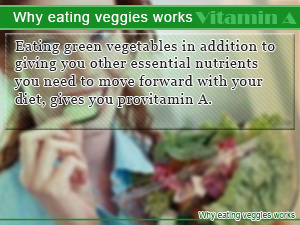 Provitamin-A found in many green vegetables acts as a substitute when you lack sufficient vitamin A in your diet. Balancing both vitamin A and provitamin A such as beta carotene helps keep your diet afloat. What foods are high in vitamin A? Vitamins in food such as fat soluble vitamin A are found in most animal products such as liver. In addition provitamin A, raw material used to make vitamin A, can be found in vegetable plants such as carrots and spinach. Similarly, beta carotene foods make a good source of vitamin A.
Vitamin A Rich Foods in your diet keep you from one sided eating that does nothing for weight loss. Keep in mind that you want to stay within the recommended daily intake for vitamin A, especially when entering pregnancy. In this healthy Slism, we provide a vitamin a rich foods list to help you explore options in your diet when trying to decide what foods you can eat to get an adequate amount of vitamin A.
Vitamin A is a fat soluble vitamin most prominent in animal products. Unlike vitamin D that gets produced by your body from being exposed to the sun, vitamin A is one vitamin that doesn't get made internally to your body. 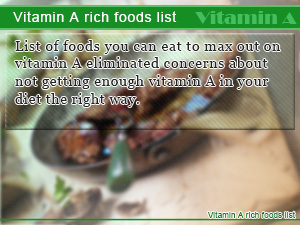 In other words, to get your daily vitamin A, you are going to have to look outside turning your attention to your diet. The nutritional value of vitamin A is affected by how your food is stored and in what food combinations you choose to eat in. Vitamin A is said to play an important role in vision, growth, and the maintenance of skin care and mucus used to absorb nutrition from food inside your mouth. When your body lacks vitamin A it can turn beta carotene taken from vegetables into vitamin A that can be used by the body. For this reason beta carotene is one provitamin A that people are most familiar with. Provitamin A carotenoids such as beta carotene come to the rescue when you lack vitamin A in your diet. The daily recommended intake amount of vitamin A including source of provitamin A is 850μg for men and 650μg for women between the ages 18 and 29, respectively. The side effects off not getting enough vitamin A in your diet are said to be having difficulty seeing at night, hindrance of growth, and a lowered level of immunity. Too much vitamin A given to infants is said to possibly cause blindness. Retinol stored in your liver prevents night blindness from occurring. How much is too much in vitamin A consumption? In a day you should not be getting more than 2,700μg of vitamin A in your diet. That's roughly 3 to 4 times the recommended intake of vitamin A. Too much vitamin A may cause headaches with risk of raising toxicity in your body possibly affecting the pressure of fluid in your spin. In some cases, people who have overdosed on vitamin A have experienced hair loss and deteriorating skin condition. When pregnant consumption of vitamin A should be taken special care of as excess vitamin A in your body may have an adverse effect on your baby. Consult with your doctor before taking vitamin A during pregnancy. For vitamin A rich foods, here is a list of foods highest in vitamin A including vegetable and animal sources such as liver rich in vitamin A to work into your program for healthy eating. Keep in mind the recommended range of vitamin A consumption when looking over this list as a reference. Beta carotene found in many green vegetables such as spinach as well as carrots and tomatoes a carotenoid that can be used in place of vitamin A retinol when a deficiency in your diet occurs. For people worried about not getting enough vitamin A in their diet, eating green vegetables containing beta carotene helps you do just that. Beta carotene food sources eaten alongside oil such as the dressing of your favorite salad is said to aid in nutrient absorption. Note that provitamin A is different than that of vitamin A taken from animal food sources. Provitamin A only gets converted into vitamin A when you lack vitamin A in your diet. That is to say if you already get enough vitamin A in the foods you eat, provitamin A is not used this way. Foods rich in vitamin C, B vitamins and vitamin K are what healthy eating with vitamin rich foods is all about. Eat less eating healthy for weight loss that works. What are the best vitamin k foods for added value in nutrition with benefits in your diet? Japanese natto is one example of foods you should be eating every day. Who needs to take vitamins when you have all the sources of vitamin B12 you need to take your diet to the next level? Here is a list of vitamin B12 foods you need. Soybeans, peanuts, and wheat germ help you burn carbs and are rich in vitamin B1 that can keep you from suffering from the side effects of not getting enough vitamin B1. Vitamin B6 keeps your metabolism running in tip top shape, especially the part that is responsible for metabolizing amino acids, the core building blocks of your body. Getting enough doesn’t have to be difficult. With a foods list of the top 10 vitamin B6 rich foods, what else do you need? List of foods you can eat to max out on vitamin A eliminated concerns about not getting enough vitamin A in your diet the right way. 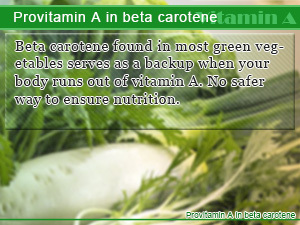 Beta carotene found in most green vegetables serves as a backup when your body runs out of vitamin A. No safer way to ensure nutrition. Eating green vegetables in addition to giving you other essential nutrients you need to move forward with your diet, gives you provitamin A.